Blame it on fall, but I am loving the dates surrounding me lately. I often think figs are my favorite fruit. Figs have such a great texture, and are not too sweet. I used to love eating them fresh off the trees in San Diego. They are just so beautifully unique. As far as dates go, they taste like nature’s caramel. Creamy, rich in dietary fiber, potassium, and Manganese (Manganese is good for your bones, anemia, and premenstrual symptoms) dates can be used in so many different ways. Smoothies, salads, oatmeal, savory dishes, brownies, or just as is. 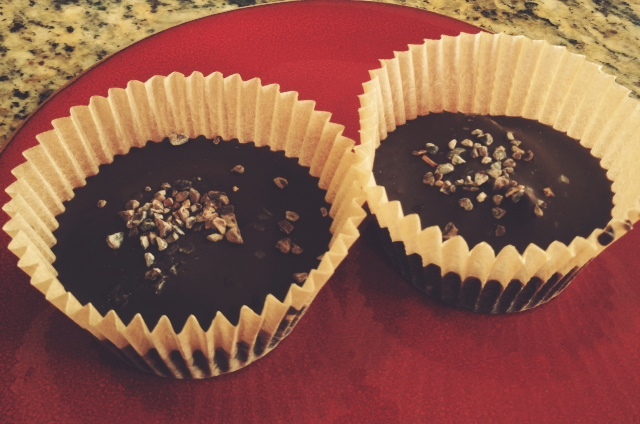 I’ve been using them to sweeten my 2 minute hemp mylk…recipe to come soon. Dates! And yes, that is a huge Kohlrabi in the background! There are endless varieties of dates grown in the Middle East, but from California the two most common are the Medjool and Deglet. My roommates just brought back a bag of plump Medjool dates from this great little place called Sun and Earth. I have yet to venture there, but they sell an assortment of bulk organic herbs, spices, and other random organic grocer products. The dates they brought back are out of this world! Its like they reached their peak of plumpness as they entered our kitchen, and hadn’t dried out too much where you’d want to re-hydrate them. They are just perfect. 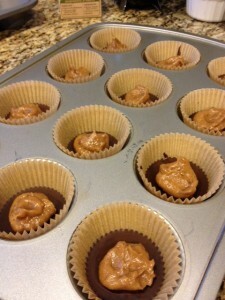 Melt chocolate chips in a small heavy bottomed sauce pan. Stir in coconut oil, and almond milk. You may want to use a small whisk to help make sure the coconut oil is well mixed in. 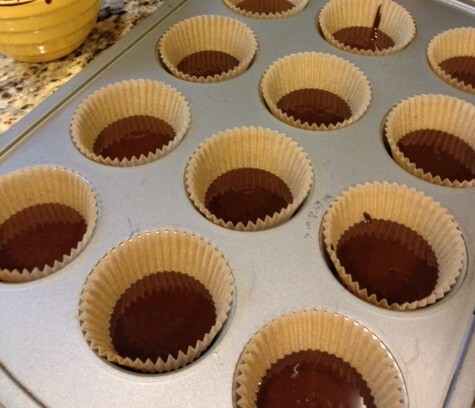 Line about 15 mini cups with melted chocolate, bottom layer! 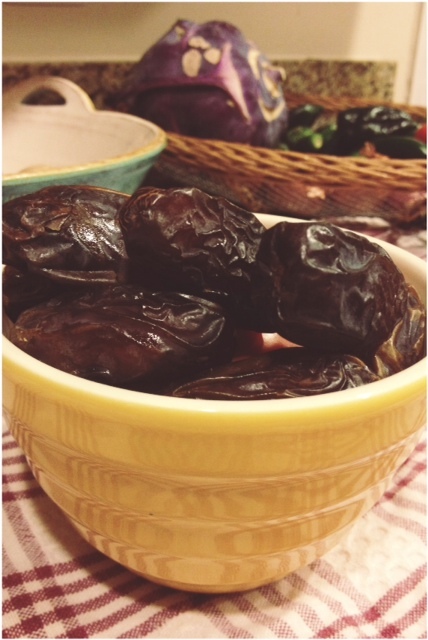 Drain soaked dates, but save the date water! Place all ingredients in a food processor. Blend until smooth, thick, and creamy. Using a spatula, scrape down the sides as necessary, making sure all gets incorporated. After bottom layer of chocolate has firmed up in fridge, layer with a caramel dollop, then top off with more melted chocolate mixture. Garnish with cacao nibs, and some course salt flakes. Place back into fridge to solidify. They should be ready to eat in 15 minutes. I was a little concerned that the melted chocolate wouldn’t surround the ‘caramel’, so I added more than I should have. Not that I’m complaining, I mean ANY amount of chocolate is fine by me. But because of this, they did turn out a tad rich. I also ended up with some of the date-caramel sauce leftover, which was great to eat with fresh apple slices! Or a spoon. That stuff is amazing, and definitely a danger to have just lying around the kitchen. The first layer of chocolate goes in… did I mention that should you happen to make a mess, this is the best finger licking recipe to have that happen?! Happy 30th Erik! This is definitely a big boy dessert! Who needs cake anyway?! 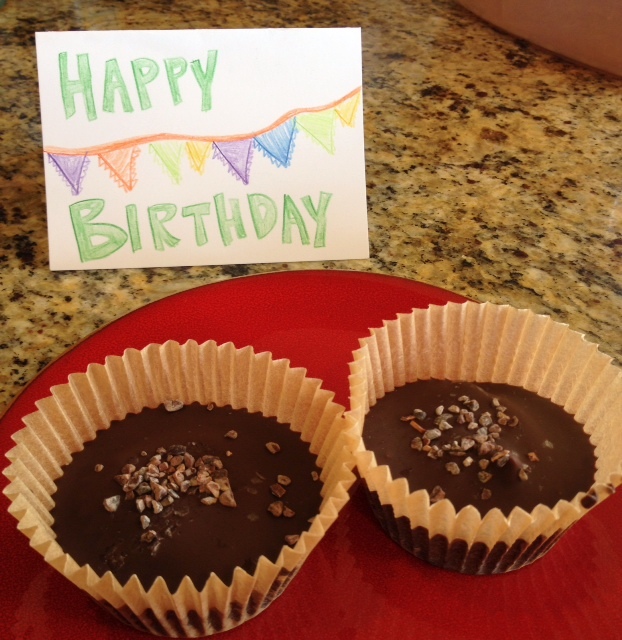 This entry was posted in Desserts, Raw Foods and tagged Annapolis, birthday, caramel sea salt chocolate, chocolate, dates, sun and earth, vegan, vegpod.